"Touch and Write Phonics" is a fun way for children to practice vowels, blends, digraphs and trigraphs - as they write with shaving cream, ketchup and more! "Touch and Write Phonics" allows parents and teachers to create individualized practice lists, and it allows parents and teachers to track children's progress! 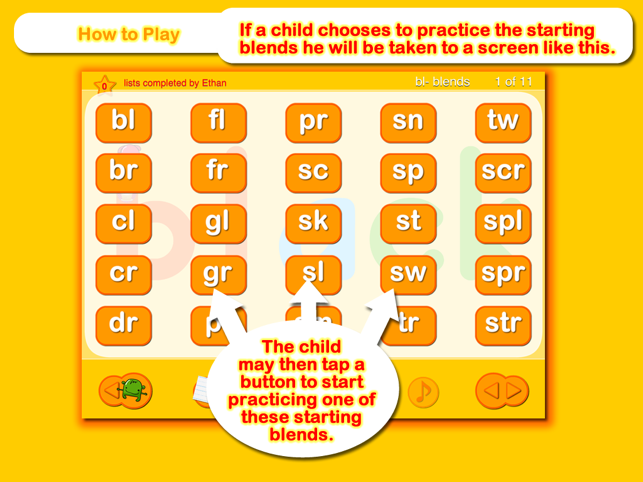 Children choose a phonics area to practice by tapping the "Vowels," "Blends" or "Digraphs" button. Children will have the opportunity to watch animations that teach about short vowels, long vowels, blends and digraphs or to practice writing words with short vowels, long vowels (with special attention to "silent e"), starting and ending blends, digraphs and trigraphs. Fun writing textures keep children engaged! Shaving cream is fun to write with, but children may switch between 18 different writing textures (along with sound effects!) Children may write with shaving cream, ketchup, lime gelatin, chocolate frosting, syrup, pudding, jelly, cookie dough, and much more! Children may also choose from 35 different writing papers - including zebra, tiger, giraffe, brick, chalk board, waffle, hieroglyphics, and much more! There are also lined papers that match school writing papers and dark papers for children who are visually impaired. "Touch and Write Phonics" allows children to write an entire word, rather than one letter at a time as in some writing apps. Blends, digraphs, trigraphs, short and long vowels are color-coded to help children learn them. After completing a word, children have a brief reward time in the prize room. 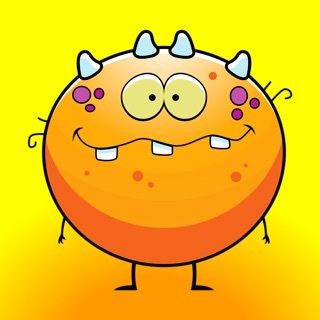 Children may drag their monster or tilt the iPad to make it eat the cupcakes. They may tap the balloons to review their phonics words – and as soon as balloons are popped, the reward time will end. Parents and teachers may change the length of reward time in the "Settings" panel. Reward time can be adjusted from 0 up to 20 seconds. 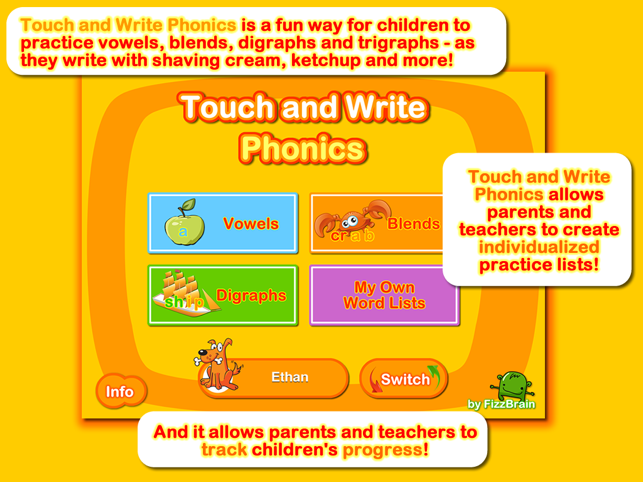 "Touch and Write Phonics" was created by elementary classroom teachers, and is based on best teaching practices. 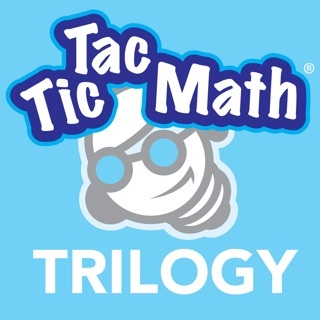 It integrates visual, kinesthetic and simulated tactile modalities to enhance learning – and fun! Parents and teachers may tap the player name button at any time to display a report of the child's practice sessions, or they may tap the "View practice reports" button. This displays the phonics lists practiced by a child, organized by date, and reports the number of times the child practiced each list. 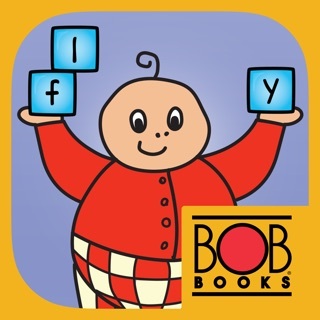 "Letters correct / total letters" allows parents and teachers to determine the percentage of letters formed without error. There is even an "Email" button to send an email copy of the report to yourself or to a student's parents. 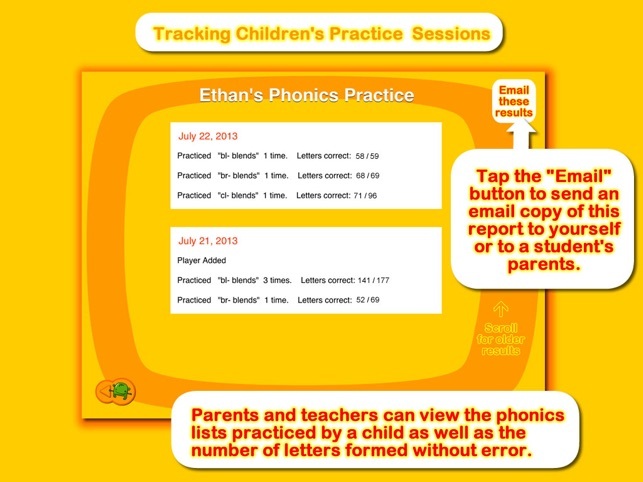 Parents and teachers can create individualized lists for children to practice. Simply scroll through the phonics words list and add words to a child's list. 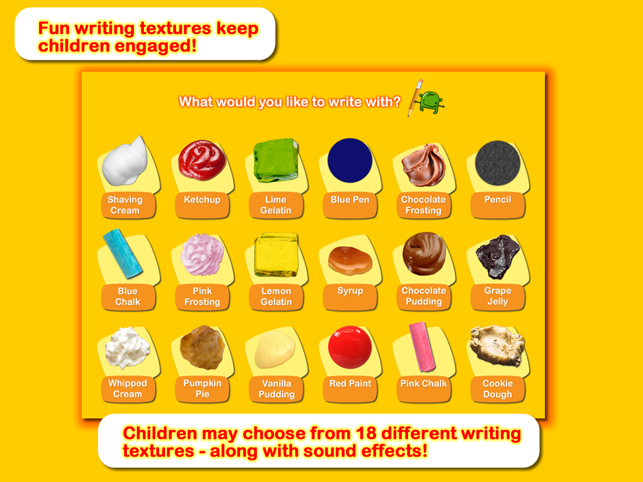 Parent reviews of our "Touch and Write" app have included comments such as: "the easiest app for me to customize." Have fun, and please contact us with any questions, problems or suggestions: fizzbrain@gmail.com . We value our customers and want to hear how we can make our products serve your needs better! We have already made many improvements based on your feedback! I have had this app for MONTHS I haven’t been able to use it once because it crashes two seconds after it opens. I don’t know the features or what the app even does. Don’t waste your money I wish I would have known before purchasing. I wish this worked. AND NOW IT DOES! Thank you, support staff. Easy fix. 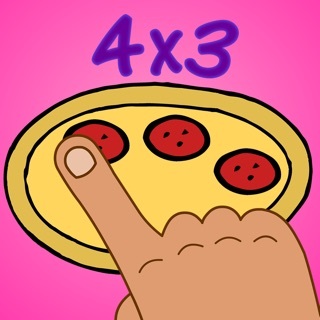 My kid loves this app, especially all the goofy stuff she gets to trace with like whipping cream and ketchup. Thanks for a great addition to our homeschool curriculum.